The American Wind Energy Association (AWEA) has applauded the decision of the US Senate Finance Committee to extend over 50 tax policies favouring wind energy through 2016. The committee secured a final vote of 23-3 in favour of extending over 50 tax policies through 2016, including the renewable energy Production Tax Credit (PTC) and Investment Tax Credit (ITC). The credits, which incentivise the American wind industry, allows wind farms to qualify so long as they begin construction while the tax credits are in place. The current credits expire at the end of this year, throwing the industry into doubt once projects currently under construction are complete. The cost of American wind has been fallen by more than half over the last five years, thanks to the federal PTC and ITC, which are predominant drivers of new wind farm development. This in turn has made the US number one in world wind energy production. In 2013, following a brief expiration of the credits, installations of new US wind farms fell by 92 percent, causing a loss of 30,000 jobs across the industry. When Congress renewed them, the industry added 23,000 jobs the following year, bring the total number of jobs to 73,000 at the end of 2014. Wind energy also brings taxes and other revenues to local communities, benefiting county and local services, schools, and health care and public safety facilities. Wind energy projects on private land deliver $195 million per year in lease payments to landowners. Republican Senator Chuck Grassley (Iowa) said in an op-ed this week that the tax credits bring certainty to investment, helping to “boost development, sustainability and expansion of homegrown renewable energy”. Industry data shows that more than 70 percent of congressional districts contain operating wind turbines, wind-related factories, or both. The wind industry is also supported by a number of private companies, such as Amazon, which has decided to operate a new 208 MW wind farm that will deliver energy into the grid supplying current and future Amazon data centres. Wind has supported economic development in all 50 states, attracting over $100 billion in private investment to the US economy since 2008. It has also created a brand new domestic manufacturing sector which has over 500 facilities across 43 states. Savings on wind power are now reaching electricity consumers, with $1 billion saved by consumers over just two days across the Great Lakes and Mid-Atlantic states during the 2014 “Polar Vortex” event, by offsetting price spikes for fuel. According to a Gallup poll conducted in March 2015, 84 percent of American voters want the country to put more emphasis or the same emphasis on producing domestic energy from wind. Two-thirds of Republicans and Independents want more emphasis. 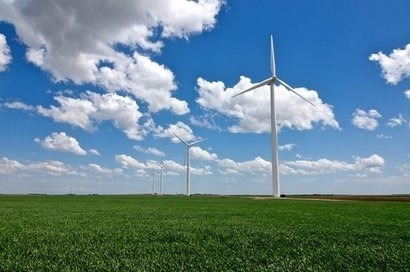 Wind Vision, a new Department of Energy (DOE) report released in early 2015, finds that with a stable policy, wind could supply 10 percent of the nation’s electricity demand by 2020, 20 percent by 2030 and 35 percent by 2050. This could support 380,000 jobs by 2030, increasing tax payments to communities of $1.8 billion per year and increasing lease payments to farmers and ranchers to $650 million per year.